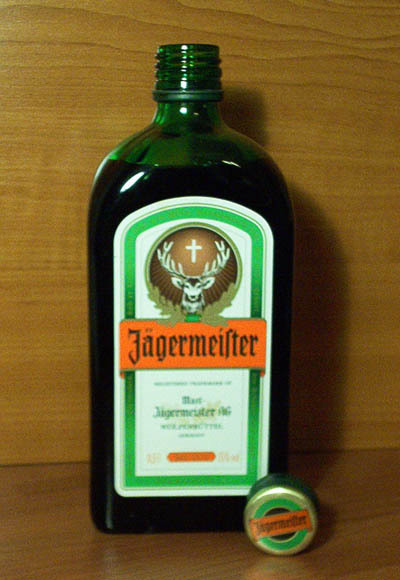 Jägermeister is a German 70-proof digestif made with herbs and spices. It is the flagship product of Mast-Jägermeister AG, headquartered in Wolfenbüttel, south of Braunschweig, Germany. Translated literally, Jägermeister means "hunt-master", combining Jäger (hunter) and Meister (master, in the sense of an accomplished professional). A free translation would be gamekeeper or forest supervisor. Left: A bottle of Jägermeister. As a legal term, Jägermeister was introduced in 1934 to designate senior foresters and gamekeepers in the forestry administration. Jägermeister’s ingredients include 56 herbs, fruits, roots, and spices including citrus peel, liquorice, anise, poppy seeds, saffron, ginger, juniper berries and ginseng. These ingredients are ground, then steeped in water and alcohol for 2-3 days. Afterwards, this mixture is filtered and stored in oak barrels for about a year. When a year has passed, the liqueur is filtered again, then mixed with sugar, caramel, alcohol, and water. It is filtered one last time then bottled. It is a digestif spirit similar to other central European stomach bitters, such as Gammel Dansk from Denmark, Unicum from Hungary, and Becherovka from the Czech Republic. In contrast to these beverages, Jägermeister has a sweeter taste and a liquorice flavor. On its website, the producer recommends that Jägermeister be consumed cold and suggests that it be kept in a freezer at −18°C (0°F) or on tap between −15° and −11°C (5° to 12°F). A shot glass of Jägermeister dropped into a glass of Red Bull energy drink makes a cocktail called a Jägerbomb (aka a Jägerbull or, in German-speaking countries, ein Fliegender Hirsch or "Flying Deer"). A Jägermonster is made using grenadine mixed with Jägermeister and orange juice. A Golden Elk is made using Goldschläger mixed with Jägermeister.